Kelly Chandler has loved running since the first grade. She started alongside her father, and it quickly turned into her lifestyle when she was growing up. She was part of her junior high and high school track and field teams and frequently participated in street races. Competing in a triathlon is on her bucket list. A runner at heart, Kelly sprints her way to her best health and well-being. She also enjoys involving her children in her routine. 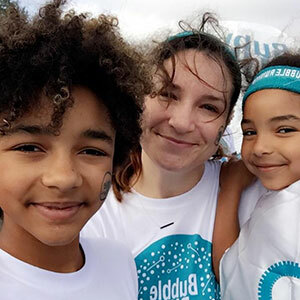 She’s passed her love of running to her two daughters – Kayla, 12, and D’Anna, 6. The trio especially enjoys participating in 5K fun runs. They’ve ran in the Color Run in State College, Pa., the Bubble Run in Eugene and the recent Foam Glow Run in Portland. Kelly says that these runs are not about setting a personal record, but having fun while being active. Still, as a single mom, finding time to be active is a challenge. She also still deals with exertion migraines she’s endured since being in a car accident during graduate school. After the accident, running brought on these deliberating headaches, even causing hospitalization. Kelly was discouraged and feared giving up the sport she loves most. Kelly says that her priorities in life have shifted. She used to put work before her health, and in the end both would suffer when she didn’t work out for long periods of time. Staying active fuels Kelly for the important things in life, including her family. She’s also able to work through ideas for manuscripts, grant proposals or classroom activities when she’s running. The occasional ice cream treat – especially chocolate peanut butter flavored – may also play a role.